Crate training a dog can be useful for many reasons, but if not done properly, crate confinement can cause a dog to experience frustration, anxiety and stress. Ideally, you want to utilize a crate to train your dog, and after that the door should be left open so he can come and go at his leisure. Is Crate Training Cruel, or Recommended? Dogs have a natural denning instinct that goes back to their days in the wild, so spending time in a snug crate is right up their alley. However, there is a limit to how long you should keep your dog in his crate as too long can be detrimental to his health and well-being. Dogs are social creatures by nature and need to spend time with their family members (whether human or furry), they also need plenty of mental stimulation and exercise, none of which can be obtained while being locked in a crate. So, let’s get down to how to do this thing right! A destructive dog – It’s not only puppies! Some adult dogs are extremely mischievous, or destructive when left alone, mostly due to separation anxiety. They may not only destroy household items, but also get into things that could cause them harm. A safe haven – Crates provide a den-like atmosphere to fulfill a dog’s instinctual needs. They allow for a special place of their own to get away from other household pets, children, thunderstorms, general noise, etc. Moving/travel – When moving or traveling, a crate can confine your pet to keep him safe. A bed/place – Provides a dog an area of his own where he can be trained to go, whether it be for bedtime at the end of the day, or you train him to go to his “place” at special times, such as during dinner so he doesn’t beg. A dog should only be locked in a crate when there is a true need, otherwise, the door should always be left open so he can come and go as he wishes. The question is, do you want your dog to enjoy his crate, or fear it? Chances are you want it to be a place your dog perceives as positive, otherwise he won’t want anything to do with it. Therefore, using the crate as a means to lock your dog away as punishment will end up working against you. That’s not to say you can’t tell your dog to go there when he is in the way, such as when he’s begging for food, or getting rambunctious when guests are over. But if, for example, your dog got into the garbage, and you severely punished him, and concluded by locking him in his crate for an extended period of time, you could very well be on your way to developing a tense, anxious dog who will want to avoid his crate at all costs. Why would an adult dog need to be crate trained you ask? Well, there could be lots of reasons. Perhaps he is destructive when left alone, needs to be crated during a move, or has never been properly housebroken. Put the crate in an area of the house that your dog enjoys, making sure it is near his people and not tucked away where he wouldn’t want to be anyway. Prepare the crate to your dog’s liking by placing a favorite toy in it along with a comfy blanket, and a treat or two. Treats will be your best friend. You can lure your pet into the crate by leaving treats first outside the door, and eventually inside the crate. 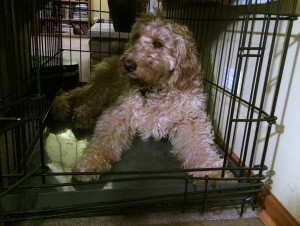 Teach your dog that the crate is a nice place to be. Any time he shows a curiosity by taking a peek into the crate, or stepping a paw into the crate, be sure to give him tons of positive attention and affection. Do NOT close the door on the crate! This should come only after your dog is feeling a bit more comfortable. Once you feel there is a certain amount of comfort with the crate, you can try closing the door for a moment and then opening it again. Initially, don’t leave your dog alone when you shut the door, instead make it a gradual process. Getting him interested in a chew toy or kong toy prior to closing the door is a good idea to ensure he is relaxed, happy, and occupied. As he gets more comfortable you can close the door for extended periods of time, eventually leaving the room in short spurts, and then longer periods along the way. Always make sure your dog is exercised and does not have to go potty prior to putting him in his crate. Leave the door to the crate open at all times. This way your dog can decide to wander in and out whenever he pleases. What Size Should My Dog’s Crate Be? The crate you choose for your dog should be large enough for him to fully stand up and turn around in, but not so large that he has room to walk from end to end. This is especially important for a puppy that you are trying to housebreak as you don’t want your puppy to eliminate in one end and sleep in the other. Puppies typically don’t like sleeping in their own messes so the perfect size crate will help him learn to go outside, and not in the crate. Yes, puppies grow! Thankfully, there is a solution so you don’t need to buy a larger crate every time your puppy has a growth spurt. Many crates have an adjustable divider panel that allows you to change the size of the crate as your puppy grows. 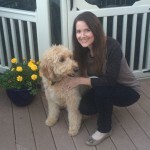 My Puppy Is Housebroken, Thanks To Crate Training – So, Now What? You may have purchased a crate for the sole purpose of housebreaking a new puppy, with the intention of eliminating the crate thereafter. What you may find, however, is that your puppy grows attached to his crate, and wants to continue to use it all on his own and into adulthood. This can be great for you and your pup as now you can continue to crate him when necessary, and he can continue using it as a comforting den. Leaving the door to the crate open at all times will allow him to use it at his leisure. This Crate Takes Up Too Much Space! And Doesn’t Match The Decor Of My Home! If you are anxious to do away with the crate due to lack of space, or simply because it is not the fanciest of decor for your home, there are many crates on the market that serve as both a crate and an attractive piece of furniture. The most common is a dog crate end table, however, choose wisely as many of these are made of wood and can be chewed through very easily. It is perfect for the dog that just needs a comfy space and where you leave the door open at all times. But, if you have a mischievous dog that needs to be locked in the crate while you are away, this is probably not the product for you. However, as a creative solution, I have heard of people inserting a metal crate inside of the wooden end table. Another idea is to just place a quality piece of wood over the top of a metal crate which can then be used as a tabletop, or bench if the crate is on the smaller side. It may not be a perfect solution, but your dog won’t be able to chew it through the bars and it really won’t look half bad!